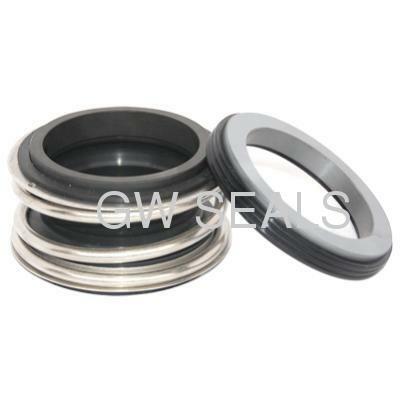 Mechanical seals of the MG1 series from EagleBurgmann are amongst the most commonly used. The bellow is not subjected to any torsional stress and its ingenious design incorporates several functions, as seal face carrier, secondary sealing element and drive collar. The seal face is driven through the spring and "L" rings. There are no bonded joints and the face materials are interchangeable without having to modify any dimensions. Highly recommended for duties with media containing solids e.g. 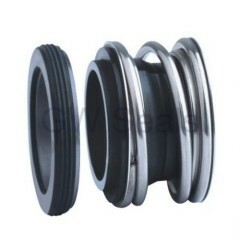 in wastewater and sewage applications. Independent of direction of rotation. MG12 Dimensions, items and designations same as for MG1, but with an extended bellows tail to achieve the fitting length I1k according to EN 12756 in combination with seat G6 or G60. (d4min acc. To EN 12756 is exceeded). 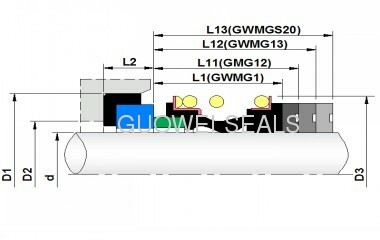 MG 13 Dimensions, items and designations same as for MG 1, but with an extended bellows tail to achieve the fitting length I1N according EN 12756 in combination with seat G6 or G60. (d4min acc. To EN 12756 is exceeded). MG 1S20 Dimensions, items and designations same as for MG 1, but with extended bellows tail to achieve the special fitting length I1s in combination with seat G50.